Question at center of Harvard trial: What counts as discrimination? A woman cheered at a rally in Copley Square last week to support the lawsuit against Harvard University. The numbers are stark: For at least 18 years, through 2013, the admissions rate for Asian-American students at Harvard University was less than that of white applicants and most other minorities. But is that actually proof of anti-Asian bias at one of the country’s premier universities? That’s at the heart of a trial over Harvard’s admissions system that will continue Monday in Boston federal district court. A string of top-level Harvard admissions officers and researchers took the stand last week to testify that the university does not discriminate against Asian-American applicants, and has never done so. This week, several others, including former president Drew Faust, are expected to be in the hot seat to defend Harvard’s use of race in admissions. 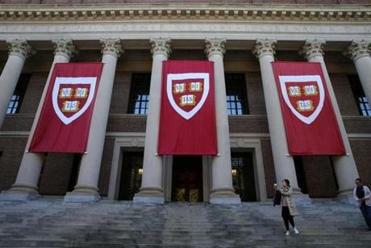 Students for Fair Admissions, which has sued Harvard, alleges that the university is limiting the number of Asian-Americans it admits every year. The university’s rating system and its inclusion of a personal score, which measures everything from applicants’ grit and “effervescence” to their blandness and immaturity, disadvantages Asian-American applicants, the group alleges. Students for Fair Admissions has pointed to Harvard’s own statistics as proof that Asian-American applicants, despite their grades, test scores, and extracurricular activities, are hamstrung by the Ivy League school’s selection process. According to Harvard’s data presented at the trial, in 2013 the university’s admissions rate for Asian-American students was 5.6 percent, lower than for whites (7 percent), blacks (6.8 percent), and Hispanics (6.1 percent). Only international students were admitted at a lower rate (3.3 percent). The overall admission rate for that year was 5.8 percent. 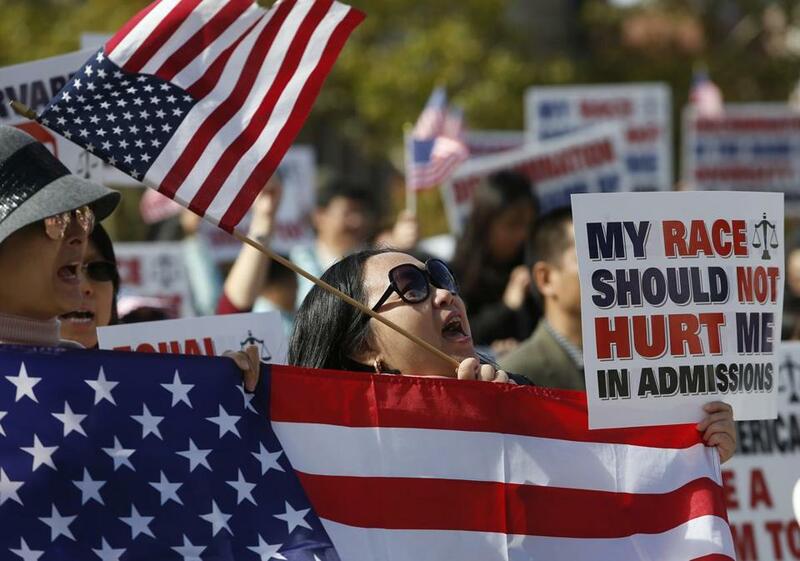 Asian-Americans were consistently admitted at lower rates than most other large racial groups dating back to 1996, according to court documents. Harvard argues that while Asians make up about 6 percent of college-age residents in the United States, they make up a significantly larger share of the university’s applicant pool, about 20 percent, and a similar proportion of its admitted students. The university also weighs a whole host of factors when admitting students that go beyond academics, extracurricular activities, athletics, and race, Harvard officials said. When those 200-plus variables that are part of the admissions decision are considered — from whether applicants’ mothers or fathers are deceased, to their intended careers, how much they have worked, the average math SAT scores at their high school, and whether their parents attended Harvard — the difference in admissions rates between Asian-Americans and white students disappears, according to the university’s analysis. “It’s never been test scores and grades alone” that will earn an applicant a seat at Harvard, said William Fitzsimmons, the university’s dean of admissions, who spent four days on the stand last week delving into the inner workings of the selection process. While Harvard officials have been famously guarded about their admissions process, at one point arguing that their internal documents were the equivalent of trade secrets, the trial has forced thousands of pages into the public domain. Some are illuminating, others are embarrassing; many explain how Harvard whittles down an annual applicant pool of more than 42,000 students to just over 2,000 students admitted. In an effort to convince federal district court Judge Allison Burroughs that the admissions process is comprehensive and free from racial bias, Harvard has also taken the unprecedented step during the trial of sharing charts and data about admissions, reading aloud portions of applications, and talking openly about what characteristics officials are looking for in applicants. “We want you to know, because once you understand how the process works, what the information is, what the evaluations are, you can understand how the decisions get made,” said William Lee, a Boston attorney representing Harvard. Students from certain geographic regions earn a “tip,” or a boost, in the admissions decision, including applicants from urban areas and specifically those from Boston and Cambridge. A student’s future major can make a difference in admissions. Harvard is on the hunt for more humanities scholars, such as those who have studied Greek and Latin, because “we think they’ll be great educators for our engineers,” Fitzsimmons said on the stand. A low-income child of a migrant worker can receive a lift in the admissions process. But it’s even more advantageous to be a top-ranked tennis player or skier. A child of a Harvard alumnus, especially one who is active in hosting events and promoting the institution, will get a closer look by the admissions office’s top staff. And giving $1 million or more to Harvard will likely earn interest from the university for the donor’s relative. In one e-mail shared in court, a Harvard dean congratulated Fitzsimmons for admitting several high-profile applicants into an incoming class, including one tied to a donor who had committed to a new building for the university. Harvard officials defended their wooing of the rich and the connected, arguing that it helps ensure that the university can be accessible to students with scarce resources who need financial aid to come to Harvard. Students for Fair Admissions said that Harvard was aware as early as 2013, because of its internal research, that some of these preferences — or as some university officials described them in a memo, a “thumb on the scale” — were hurting Asian-American applicants, who were being admitted at a lower rate. A draft report by Harvard’s researchers found that if students were accepted on academics alone, Asian-Americans would be admitted at more than twice the current rate. Harvard argues that research was incomplete and that a more comprehensive analysis of the data done for the trial shows no bias. Yet whether Harvard admissions officers are unconsciously providing preferences for some students while holding back others remains an open question. “Are there times when you don’t realize that you’re tipping for something or, like, anti-tipping for something, and then you go to the data and it shows that there actually is a tip that you didn’t really intend or know about?” Burroughs asked a Harvard admissions official on the stand. Economists for Harvard and Students for Fair Admissions will take the stand later this week and begin dissecting the data in the hope of answering that question.